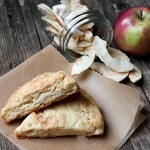 Delicious dried apple scones recipe, with cream cheese for flavour and moistness. 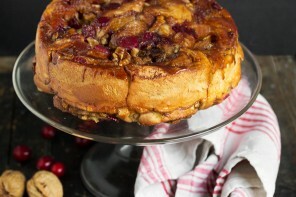 Also, how to make the dried apples at home in your oven! If you’ve never tried scones with cream cheese, you don’t know what you’re missing. They are incredibly moist and full of flavour. Since it’s Fall, I wanted to add a little apple, but I was worried the extra from the apples might affect the texture of the scone. Dried apples seemed like the answer, so I made a small batch at home. This method will make de-hydrated, but soft dried apples, that you can use for baking, mixing into granola, yogurt or oatmeal or snacking. Try dipping them in caramel or peanut butter. 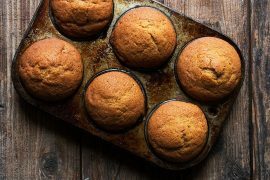 • Place a baking rack on top of a baking sheet and set aside. • In a large bowl, combine the juice of one lemon with an equal amount of water (I just eye-balled it). • Peel and core 4 or 5 apples. Any variety of apple is fine. Slice into slices. • Put the apple slices into the bowl with the lemon juice and toss to thoroughly coat the apples. • Remove apples to a sheet a paper towel and pat the top of the apples dry, as well. • Transfer the apples to your prepared baking rack. • Place in the oven and allow to bake for 5 to 6 hours. (*Every once in a while I would open the oven door for a few seconds to allow any moisture building up in the oven to escape. Not sure it’s really necessary, but if you’re walking by anyway, it can’t hurt). 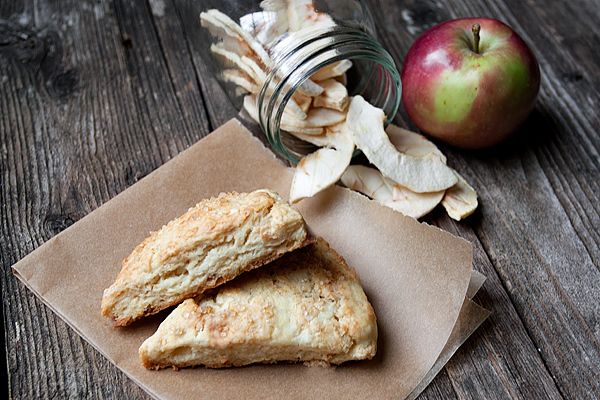 The cream cheese in these scones ensure they are always moist, while the sweet, dried apples add great flavour. If you find the dried apples difficult to dice, simply tear them into small pieces. Preheat your oven to 400° F. and prepare an ungreased baking sheet by lining with parchment paper or a silpat. In a medium-sized bowl, whisk together the flour, sugar, baking powder and salt. With a pastry blender or a fork, cut in the cream cheese and butter, until the chunks of butter are the size of peas. Stir in the dried apples. In a separate small bowl, whisk together the egg, vanilla and milk. Add these wet ingredients to the dry mixture and stir with a fork until the dough is evenly moistened. Turn the dough out onto a floured piece of parchment paper and fold the dough over onto itself several times, until it holds together. Pat the dough into a 3/4″ thick square or circle. Cut the dough into desired size of squares, wedges, or diamonds. 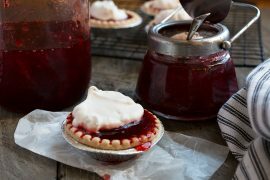 Brush the tops lightly with milk and sprinkle with sparkling white or demerara sugar. Place the scones about 2 inches apart on the prepared baking sheet. Bake for 18-20 minutes, until the tops are light golden brown. Serve hot, with butter or jam. Delicious scones, love the cream cheese in these. I dehydrated my apples in the microwave- not completely to a crisp but enough to get ride of most of the moisture. I added white chocolate chips which caramelized perfectly during the bake and topped them with cinnamon sugar. Sounds delicious! So glad you enjoyed them :) Thanks! Thank you so much for sharing your tips on how to dry apples in the oven. I’m so happy to finally find a recipe that doesn’t require a dehydrator. Do you have tips for drying other fruits in the oven as well? In theory, this method should work for other fruit as well. Low, slow heat for long enough to remove the water in the fruit is all that’s really needed. Question Jennifer, how do you recommend storing the dried apples? How long will they keep? Hi Kelly, After I remove the apples from the oven, I let them sit at room temperature for at least 6 hours and then I store in a jar. I watch the jar on the counter for a couple of days to see if any condensation builds up (it usually doesn’t). As long as there is no moisture in there, they should be good in the jar in a cool, dark place for several months. If there is condensation, I store in the fridge and use them up right away. I believe you can also freeze them in a ziploc bag. (I think I would freeze them on a baking sheet first, then transfer to a ziploc bag). Hope that helps. Hi Angie and thanks so much. These scones were delicious and the cream cheese in them was a lovely addition! Wow! I just stumbled upon your blog and I love it! I can’t wait to peruse your archives, but for now I just wanted to say a quick hi! 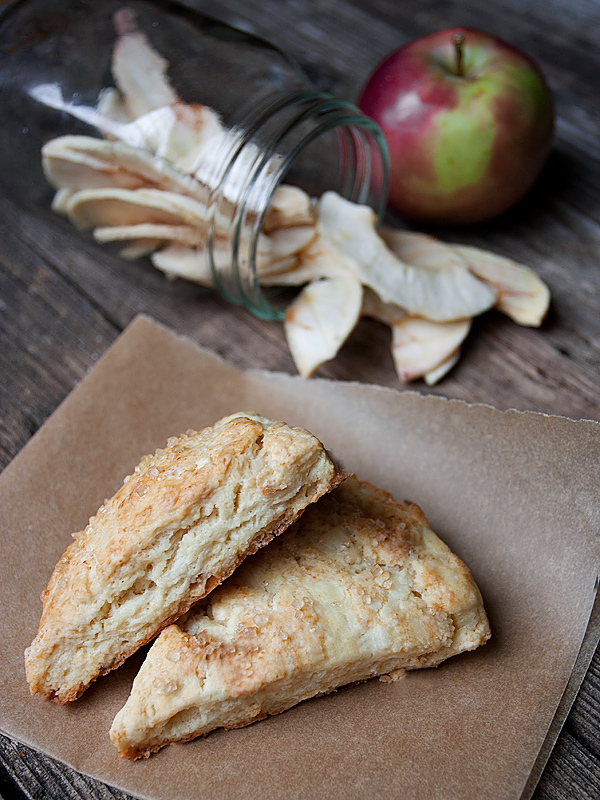 I adore apple crisps! Makes me wish they were in my oven right now! And cream cheese scones, you can’t go wrong. The cream cheese in these scones is so good. It really gives great flavour and moisture to them, with little hits of sweet apple here and there. They were lovely! Thank you for the tutorial on how to make dried apples at home! That will be handy! Great photos, too. You’re welcome, Julia. They are so easy to make in the oven!